Part of the initial wave of food trucks in White House, Jaws Jumbo Burgers is rather proud to stand out and still have one of the more diverse menus. Don't get us wrong, there are plenty of great things coming from the kitchens of our wheeled brethren. In fact, it's because of them that we've gotten to where we are. One of our staple spots, The Food Park, wouldn't exist without the other trucks. Now, the ultimate goal is to get ourselves a brick and mortar spot. And we're looking around for the perfect place, but taking our time - no need to rush it. We'll keep you posted 'cause we know you'll be interested to see just what we come up with. Whatever happens, we'll be sure to keep the food truck on the street - word is there’ll be a revolt if we dont. WHITE HOUSE, TN. 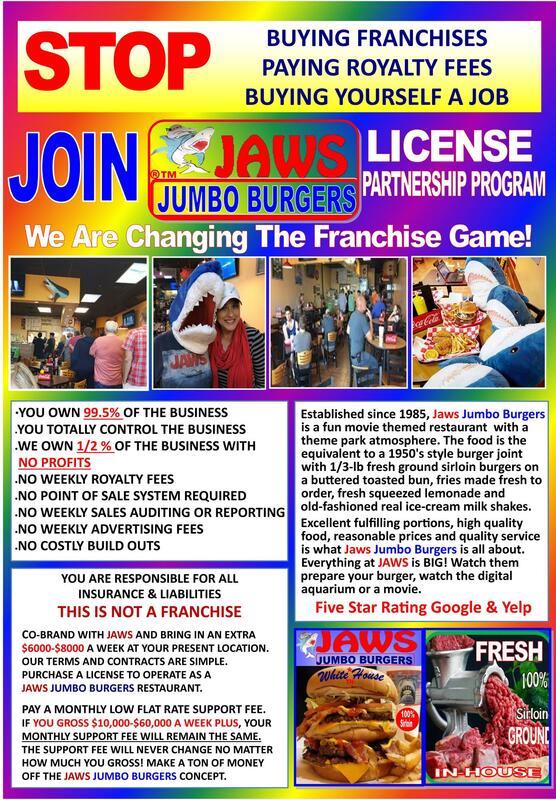 - Jaws Jumbo Burgers a movie themed burger concept announces today plans to open multi- units with an innovative limited partnership licensing agreement. The brand is offering future prospects the opportunity to operate a Jaws Jumbo Burgers with 99.5 % ownership of the business. The partner/owner is responsible for all business costs and liabilities. Jaws will own .5% the business along with a monthly flat rate partnership support fee. The partner/owner keeps all profits obtained from the business and pays no weekly royalty, advertising, or other hidden fees. The Brand also does not mandate weekly reporting or auditing, leaving no need for a POS system. 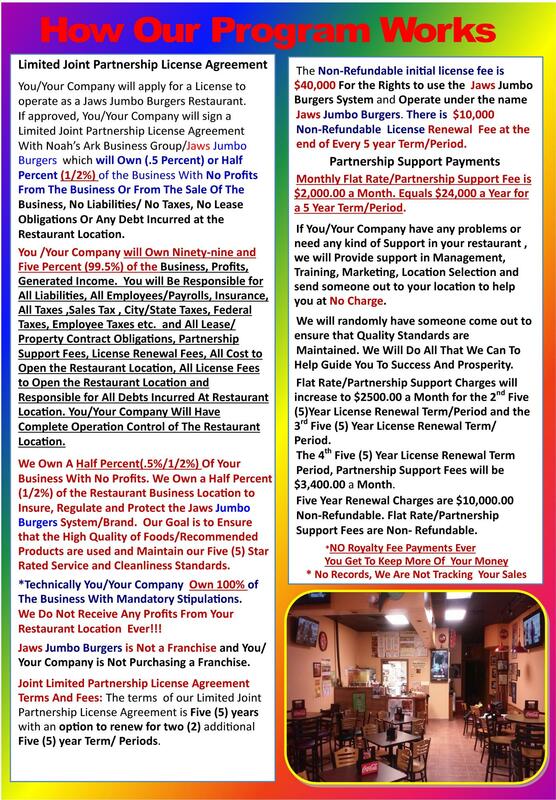 The Limited Partnership Licensing Agreement is unconventional in that it does not require all the costly fees that are associated with traditional franchised restaurants. The company touts that the partner/owner gets to keep all the money they make in their Jaws Jumbo Burgers restaurant. 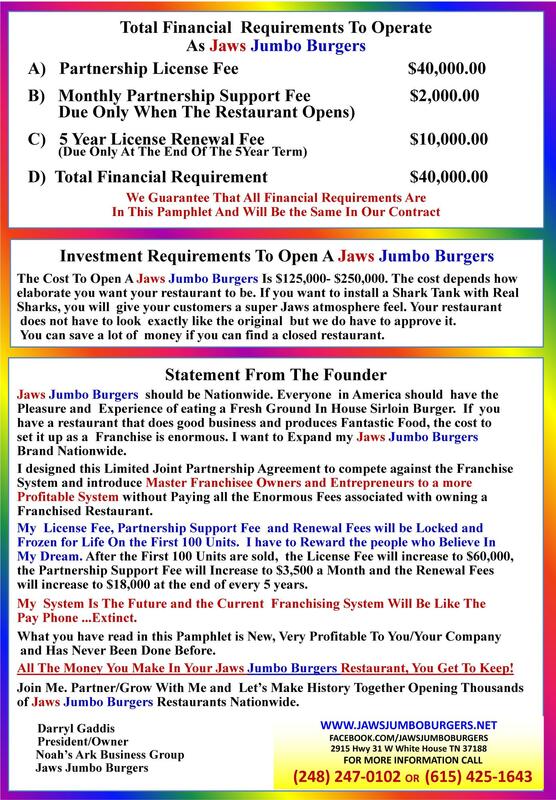 A non-refundable license fee of $40,000 is required for the right to use the Jaws Jumbo Burgers system and operate under their name, along with a monthly flat rate partnership support fee. For more information about Jaws Jumbo Burgers visit: www.jawsjumboburgers.net. For more information on partnership agreement opportunities visit: www.jawsjumboburgers.net/partnership. Jaws Jumbo Burgers is a fun movie themed restaurant with a theme park atmosphere. The food is the equivalent to a 1950's style burger joint with 1/3-lb fresh ground sirloin burgers ground in-house on a buttered toasted bun, fries made fresh to order, fresh squeezed lemonade and old-fashioned ice-cream milk shakes. Everything at JAWS is BIG. The restaurant is unique in that it caters to families and individuals from all generations that love and adore Steven Spielberg’s blockbuster hit Jaws. Jaws Jumbo Burgers is known for excellent fulfilling portions, high quality food at reasonable prices and quality service. Everything at JAWS is BIG!